Kia Motors represents the truest form of the American dream. Long ago in 1992, Kia immigrated into the U.S. and brought with it little more than the proverbial change in its pocket. The Korean automaker had ambitious dreams of striking it big and making a name for itself within the free 50 states that span the North American continent. Ambition and tenacity would come in handy as the young automaker rolled out products that were less than popular with buyers used to elbow room and reliability. However, as time marched on, the young automaker grew up. It began making vehicles the car-buying public actually took interest in. Sales began to grow, as did the level of talent within the design and engineering teams. Improved looks and better quality interiors soon started finding their way into Kia’s model lineup, improving year over year. Reliability grew as well, netting some notable awards that further assured potential customers. Soon, Kia Motors and its sister company Hyundai, found themselves unofficially considered a respectable automaker in the land of dreams. 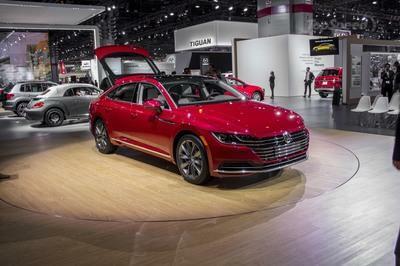 The twins aren’t resting on their laurels, though, as both are rolling out premium products that evenly compete against the vehicular industry stalwarts like Ford, Toyota, Honda, and even Lexus. That brings us to Kia’s latest and greatest product, the 2014 Optima. The new Optima carries the torch by sporting a slight refresh and reworked interior over the outgoing 2013 model – one that enjoyed incredible sales of over 150,000 units last year alone. Without messing with success, Kia has moved the Optima into the new year with extra levels of refinement and class – something never associated with the automaker just 15 years prior. Updated 5/15/2014: Kia has announced that the 2015 Optima will feature a few changes to make things a little easier inside the cabin. These changes include the moving of the cruise control buttons into an easier-to-access part of the right spoke of the steering wheel, new brushed bezels on the SX model’s D-shaped steering wheel and white contrast stitching in the SX trim. Additionally, the LX model has optional black cloth upholstery. The biggest change, however, is the addition of the next-generation UVO system as an option on the EX, and SX trims — the SX Limited gets the UVO system as standard. There are also a few color changes and an upgraded windshield on all trim levels. The 2014 refresh includes mostly cosmetic changes to the exterior and interior of the car. Outside, the front and rear fascias get most of the work, while the doors and roofline stay unchanged. 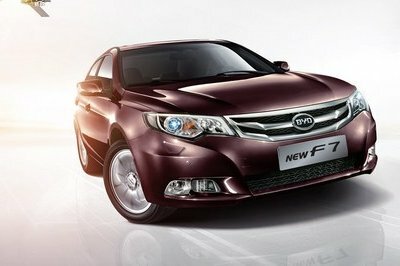 Up front, new LED lighting above the headlights and quad-shaped fog lights look sharper and more refined. Kia’s “tiger nose” grille is prominently displayed with piano-black trim flowing to either side and into the clear headlight covers. Moving rearward, new 16-, 17-, and 18-inch alloy wheels (no steel wheels and hub caps here!) are optional and coordinate to trim levels. Standard heated exterior mirrors feature turn signal repeaters and chrome accents line the door handles. Up above, a glass roof brings light into the cabin while adding a classy look with the continued piano-black trim style. Out back, even more LED lighting is found. A revised taillight design further separates the 2014 from previous model years. Down low, chrome-tipped dual exhausts and faux center air diffuser lend a sportier look to the four-door sedan. 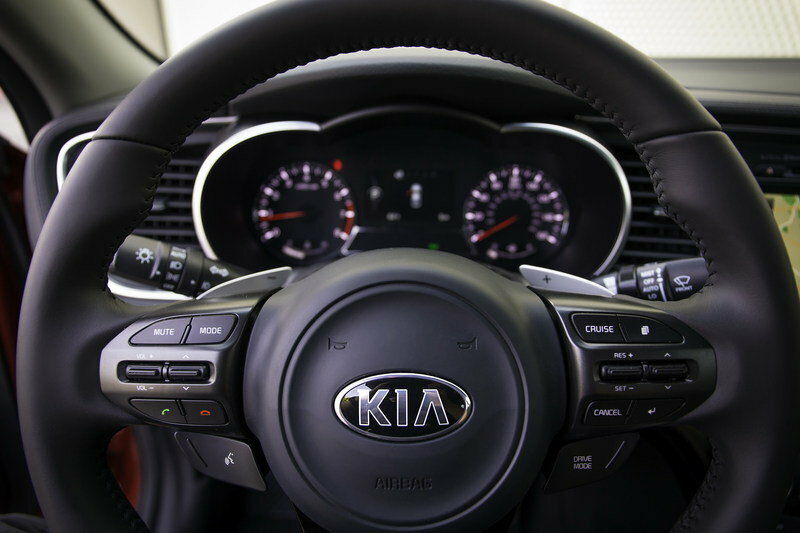 Kia reworked the interior to be more technically advanced, more inviting, and more comfortable over long distances. Helping achieve those goals, are all-new seats that out-class the outgoing units. Beautiful quilted Nappa leather is optional, and when ordered, continues onto the door panels for a really nice touch. The driver will notice a new steering wheel design that looks cleaner and more refined. Two new info screens make their home on the dashboard – one within the center stack, the other between the analog gauges within the instrument cluster. The latter is a 4.3-inch TFT display designed to inform the driver of critical information, while the optional 8-inch center-stack touch screen hosts the navigation and audio features. 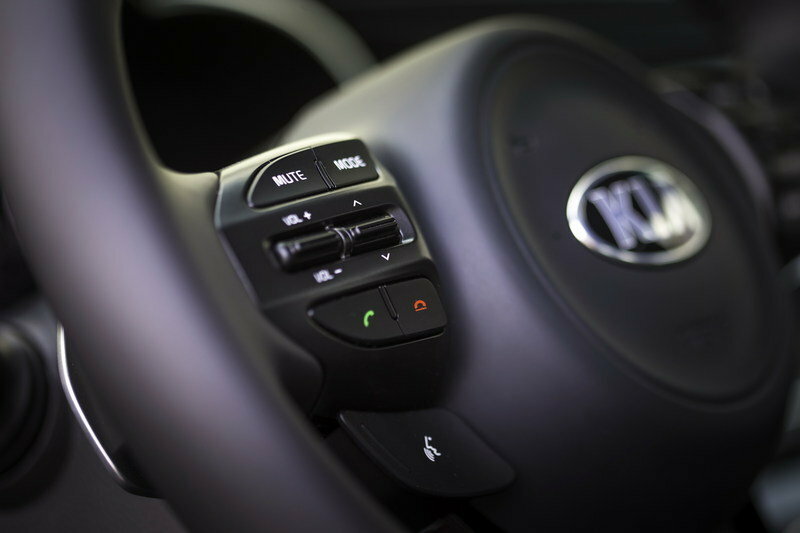 Thankfully, Kia left real knobs to control the most common functions. 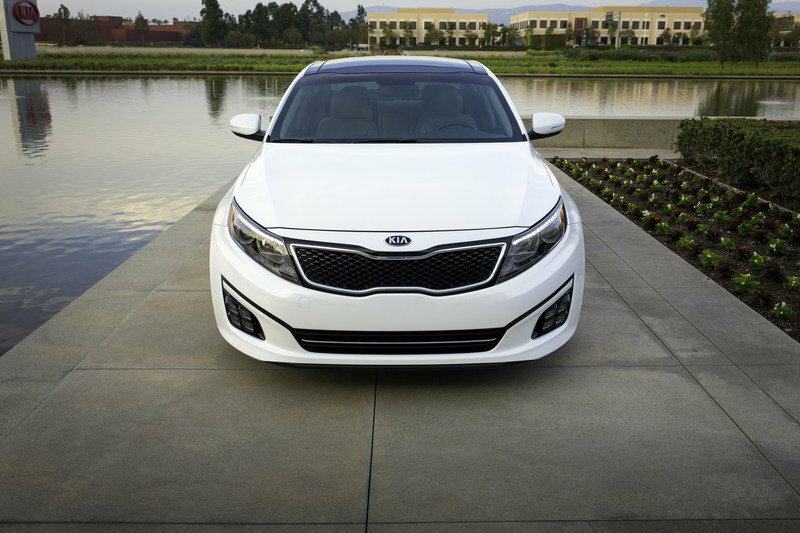 The Optima offers an eight-speaker Infinity sound system, HD Radio with SiriusXM, SiriusXMTraffic and UVO eServices. Bluetooth and USB auxiliary inputs are present as well. Active safety features integrated into the infotainment system include Blind Spot Detection, Rear Cross-Traffic Alert, and rear parking sensors. Rearward, backseat passengers get the same generous legroom as before, along with the optional quilted leather and standard folding center armrest. The rear seatbacks also fold, making hauling long items from the home improvement store a cinch. Overall, we like the cabin’s new look and expect it to feel much better too. Fit and finish has continually gotten better over the years with Kia, and we don’t expect anything less with this model’s mid-life refresh. 40.0 in. / 37.6 in. 57.3 in. / 55.7 in. 45.5 in. / 34.7 in. 54.7 in. / 54.5 in. Beneath all the changes within the cabin and exterior lies two available carryover powertrains: a 2.4-liter in-line-four and a 2.0-liter turbocharged in-line-four. 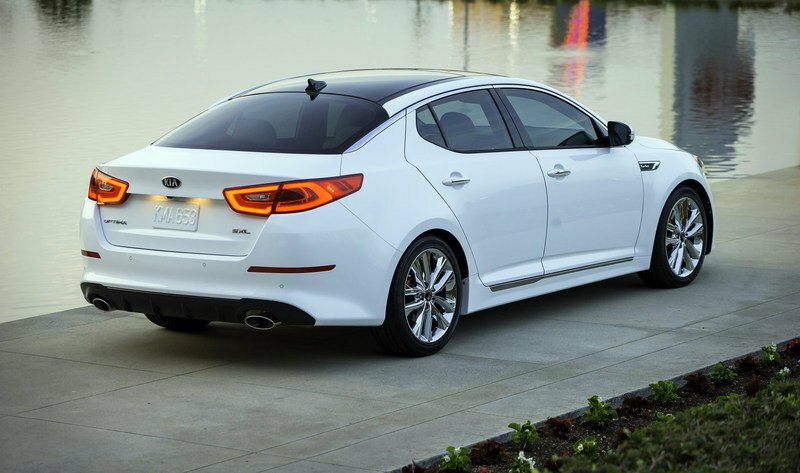 Both feature Kia’s GDI, or gasoline direct injection system and are members of the Theta II powertrain family. The standard 2.4-liter delivers 192 horsepower and 181 pound-feet of torque – enough to send the 3,500-pound car from naught to 60 in roughly 8.5 seconds. The smaller-displacement, yet substantially more powerful 2.0-liter turbo GDI engine makes 274 horsepower and 269 pound-feet of torque. 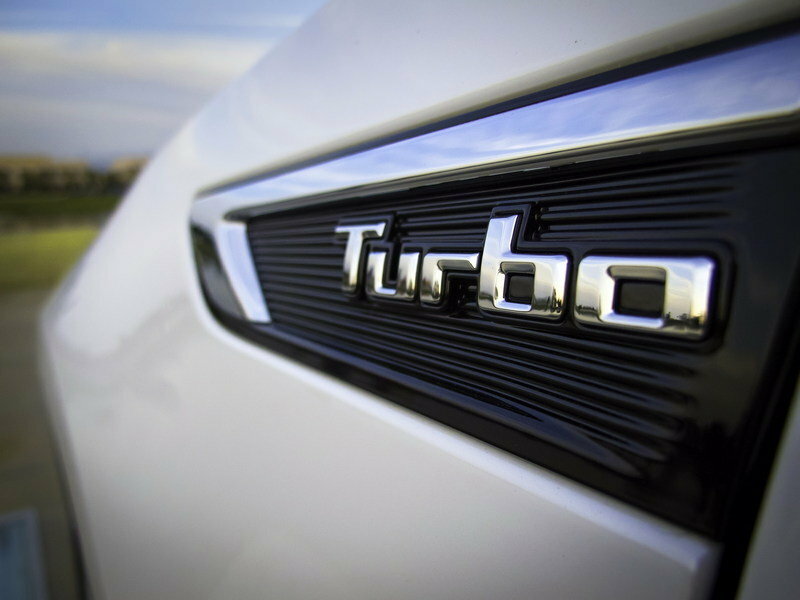 The turbo model requires only 7.2 seconds to reach 60. There’s no doubt which is the driver’s choice. Power is routed to the front wheels through a six-speed automatic transmission with either engine. The transmission features what Kia calls “Sportmatic clutchless shifting.” New for 2014 and only available in SX trim, (the sportier one) is Drive Mode Select, which adjusts the shifts points and steering weigh. We’ve yet to try it, so we’ll hold our opinions until then. 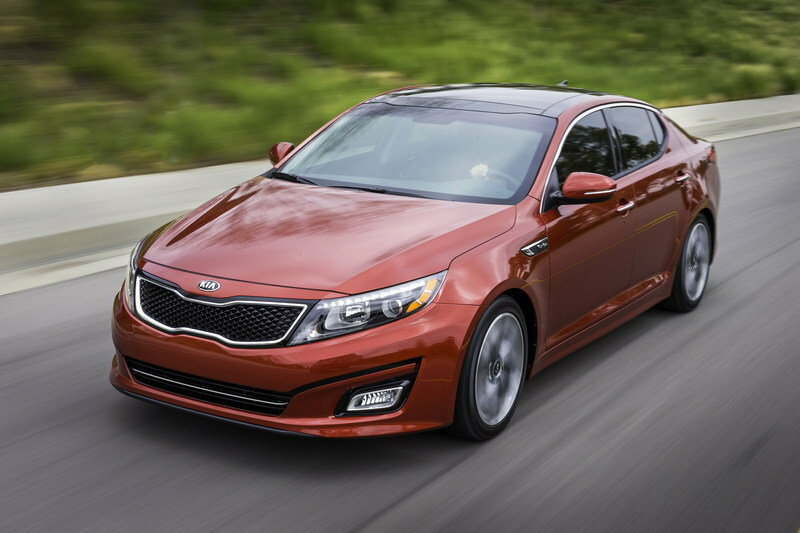 The Optima sits on a unibody platform with an independent suspension set-up front and rear. MacPherson struts and a thick anti-roll bar keep the nose planted while a mulit-link setup with coil springs are out back. A hydraulic, power-assisted rack and pinion steering system relays driver inputs to the tarmac while 11.8-inch vented rotors up front and 11.2-inch solid discs bring the Optima to a stop. Red brake calipers are a classy addition to the Limited trim. The Optima enjoys premium rolling stock coming in three sizes: 205/65R16 on the LX trim, 215/55R17 on the EX trim, and 225/45R18 on the SX and Limited trim levels. Thankfully, no matter what trim level you order, the Optima comes will alloy wheels. No hubcaps or black steel wheels in sight. Kia seems to have done their homework in this department. Even with all the premium and upscale accoutrements, the Optima has a fairly low starting price of $21,500. Moving past the LX trim into the volume-leading EX trim, prices only jump to $23,900. 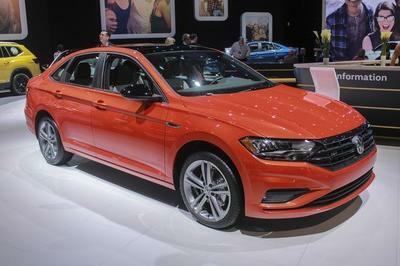 The sporty SX trim with the base 2.4-liter engine starts at $25,250. Getting into the SX turbo models is where the price starts to increase, no not wildly out of hand. The base asking price for a SX Turbo is $27,200. Adding the Limited package to that shoots the price to a large $36,300. In some respects, the $36k is a reasonable price to pay considering all the features and refinement the 2014 Optima offers. However, it’s $36k for a Kia. Allow me to elaborate... The features, strong engine, and refinement may be worth the big bucks, but what’s missing is the clout, the brand-respect that other segment competitors possess. 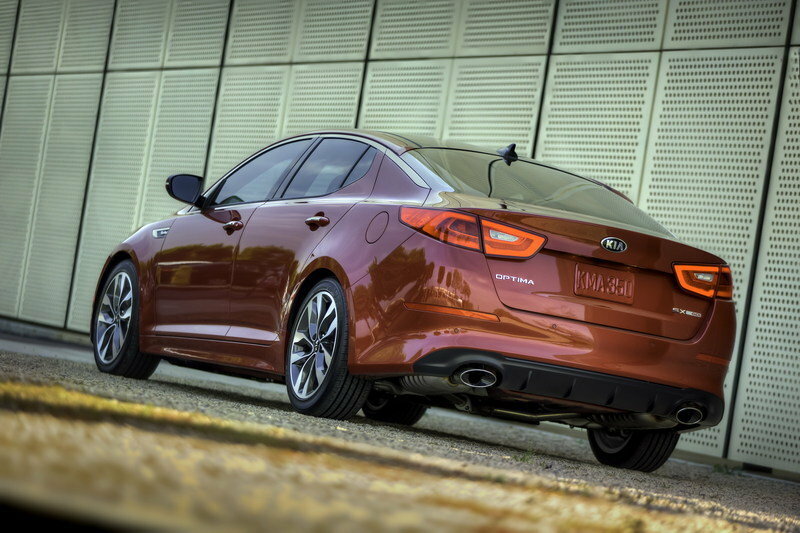 The catch, though, is that Kia is on its way up – now fighting for brand-respect in the up-market segment. It’s reminiscent of Lexus’ early years. 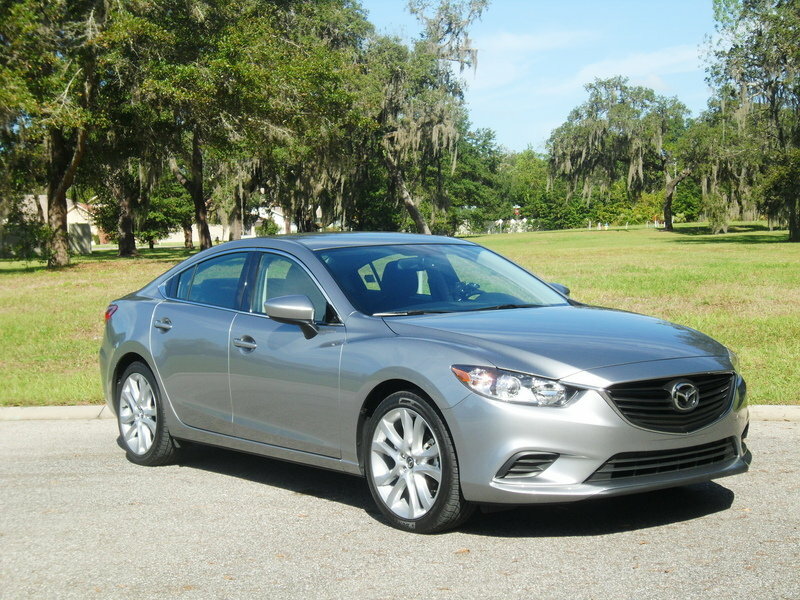 The Mazda6 has been a mainstay in low-cost sports sedans for a while. With its “zoom-zoom” handing and potent powertrain, the 6 gives buyers a great compromise between a family sedan and a traditional sportster. Its Skyactiv-G 2.5-liter I-4 makes 184 horsepower and 185 pound-feet of torque. Fuel economy is one of the 6’s selling points: 25 mpg city and 37 mpg highway, and when we last drove it, 26 mpg combined. Starting price for a base model is $20,990 and climbs with options. 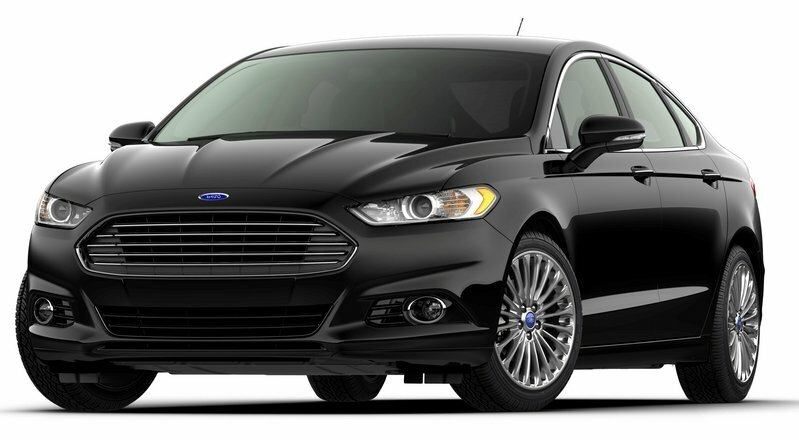 The Fusion is a beautiful car inside and out. Its Aston-Martin-look-alike exterior and cleverly-designed interior make it a solid choice for a family hauler. Although it looks great, the interior does suffer from cheap plastics in more than one area. 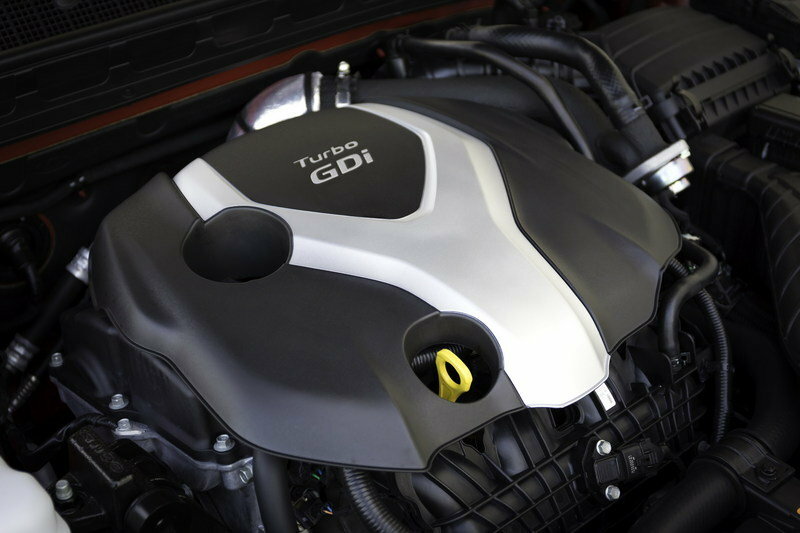 Its top-performing engine is a powerful 240-horsepower 2.0-liter EcoBoost in-line four. EPA ratings for the EcoBoost in front-wheel-drive form come in at 22 city, 33 highway and 26 combined. Starting price for a base Fusion is $20,795 and rising to over $33,000 for an AWD 2.0-liter EcoBoost model. The 2014 Optima is a solid half-step forward for the nameplate. The mid-cycle refresh makes the car more competitive and attractive, while keeping what wasn’t broken. With stellar sales in 2013, 2014 should see its fair share of success considering the handsome improvements made. 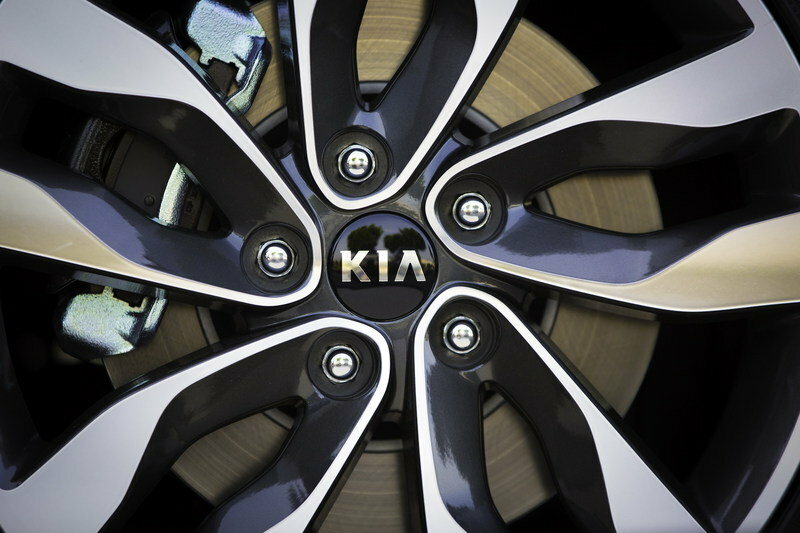 Kia represents something special, something respectable in both the automotive and business worlds. It has climbed its way up, seizing opportunities and expanding its reach over the entire globe. It has certainly impacted the American auto marketplace for the better. Kia’s climb is far from over as it looks to move even further up market, but at this point, it’s a long way from the bottom. 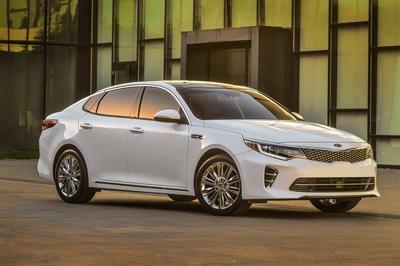 Kia Motors America (KMA), one of the fastest-growing car companies in America over the last five years, debuts a significantly updated version of its best-selling Optima mid-size sedan on the heels of the 2013 SEMA Show. Just three years ago, Kia turned the automotive world on its head when the Peter Schreyer-penned Optima was unveiled at the 2010 New York International Auto Show. Since then, Optima has become Kia’s sales leader, selling more than 150,000 units last year and gaining worldwide acclaim for its European-inspired design and fun-to-drive performance. The 2014 Optima, built in the U.S.* at Kia Motors Manufacturing Georgia (KMMG) in West Point, Ga., arrives with updated front and rear fascias, retaining the vehicle’s dynamic and sporty proportions. Now available in LX, EX, SX, SX-Turbo and SX-Limited trims, the Optima’s new premium amenities and convenience add fresh allure to this runaway success story. In a segment long known for bland functionality more than emotional appeal, the 2014 Optima cements the model’s status as a trailblazer combining style, substance and value. Refining the Optima’s sculpted, high-end appearance, Kia’s Frankfurt-based design team focused on the vehicle’s front and rear fascias and the brand’s signature tabbed grille. The vehicle’s bold stance and aerodynamic shape are further accentuated by updated rear diffusers and a sweeping trunk lid. Illuminating the European-inspired design are striking front LED positioning and fog lights, along with bright, newly designed LED rear lamps. The improvements continue within the cabin of the 2014 Optima, as drivers are greeted with more upscale and high-tech amenities. Activating the Optima’s push button ignition brings two new displays to life: a rich 4.3-inch TFT LCD instrument cluster and an optional high-resolution 8-inch navigation and telematics screen, featuring UVO eServices, an 8-speaker Infinity®2 sound system, HD Radio™®3, SiriusXM Satellite Radio4 and SiriusXM Traffic4. Redesigned seats help ensure a comfortable drive, while an optional new Blind Spot Detection (BSD) system5, which includes rear cross-traffic alert and rear parking sensors, provides added convenience and peace of mind. 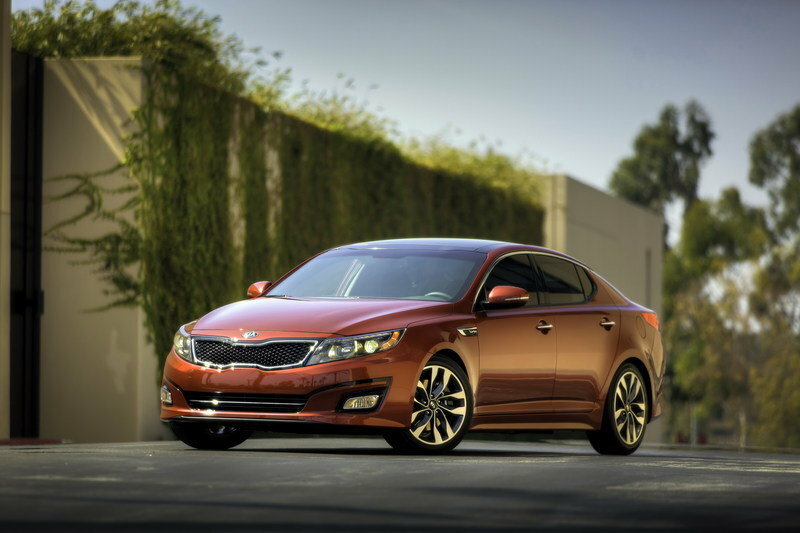 Every 2014 Optima comes well equipped with a generous roster of standard features. The LX trim offers dual exhaust with chrome tips, solar glass, exterior mirror turn signal indicators, front fog lights, exterior heated mirrors, chrome accented exterior door handles, new 16-inch alloy wheels fitted with 205/65R16 tires, and a six-speed automatic transmission. The volume-leading EX trim offers larger 17-inch alloy wheels fitted with 215/55R17 tires and adds leather-trimmed seats, 8-way power adjustable driver’s seat, and illuminated front cup holders. Moving to the SX trim brings stylish new 18-inch polished alloy wheels with 225/45R18 tires, unique front and rear lower bumpers and side sills, and aero wiper blades. The SX-T includes HID headlights with auto leveling. Elevating to the top-of-the-line Limited trim takes Optima to another level of sporty refinement, adding unique 18-inch chrome wheels, new LED fog lights, red brake calipers, an electronic parking brake, chrome accented side sills, and premium Nappa leather-trimmed seats. The 2014 Optima offers two available and powerful Theta II powerplants featuring gasoline direct injection (GDI) technology: a 2.4-liter GDI four-cylinder or a 2.0-liter GDI turbo engine. 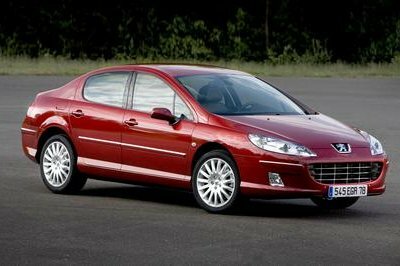 The 2.4-liter GDI engine is available on LX, EX and SX (non-turbo) models while the 2.0-liter turbo GDI engine is offered exclusively in the SX-T and SX-L. This turbo-charged unit delivers V6-type power with a four-cylinder’s efficiency. Each engine choice is mated to a six-speed automatic transmission featuring Sportmatic® clutchless shifting. 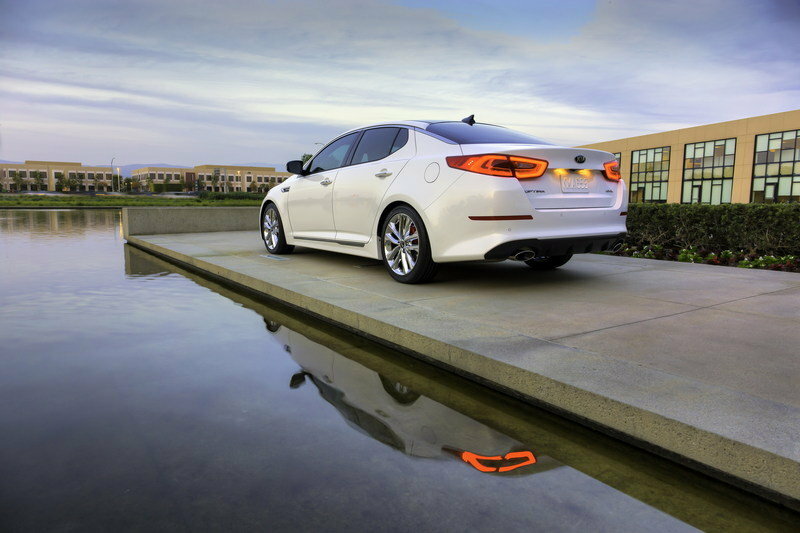 New for the 2014 Optima, and exclusive to the sporty SX variant, is Drive Mode Select (DMS), which adjusts transmission shift points and steering weight, offering owners a customizable driving experience.